is an award winning songwriter vocalist and guitarist. Johnny has earned Atlanta’s Creative Loafing Magazine’s critic’s choice for “Best Local Singer/Songwriter”. He’s the 2013 & 2015 & 2018 Georgia State Champion Harmonica Player. The 2013 Flagpole Magazine Athens GA 25th Anniversary theme song contest winner. 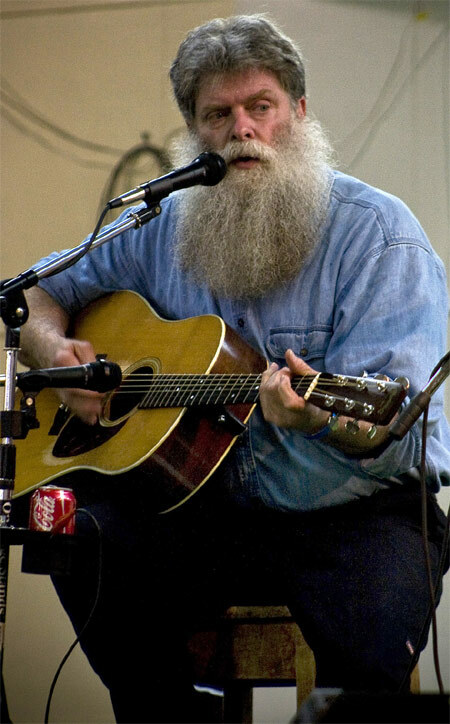 He’s also won on the original Gong Show as well as Georgia Music Magazine’s “The 25 Local Albums For 2005” and the Georgia Music Industry Association’s “Best of Country” award. His music has appeared in movies, television and on the radio. In his latest (29th) album titled “Mother Nature’s Husband”, Johnny brings his awkward sensibilities to bear on straining the limits of Folk and Bluegrass. Mr. Roquemore’s songs contain good music and intelligent lyrics. Therefore may not be suitable for today’s listener. To hear examples, click on the player on the right. 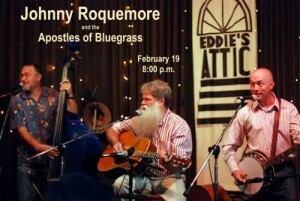 Led by Johnny Roquemore, Creative Loafing Magazine critics’ choice for “Best Local Singer/Songwriter” in Atlanta, the Apostles have played everywhere. Johnny, a Georgia native, returned from Malibu, California after 30 years of hobnobbing with the bigwigs of music. Dubbed the “Minstrel of Malibu”, he has come home to live on the family farm in Mansfield. The Apostles of Bluegrass show has consistently amused audiences by delivering misunderstandable reworkings of cherished traditional music and offbeat renditions of original compositions. Johnny – Guitar, Vocals and Harmonica. The Apostles of Bluegrass win the South Eastern Bluegrass Association / Stone Mountain Bluegrass Festival Band Contest. From Mansfield, Georgia – This trio tweaks the traditional trappings of the genre into a triumph of antiphony. Unexpected turns lead the listener from reggae to swing to Tennessee Ernie Ford. It’s not just Bluegrass, its music, and somehow the judges thought the Apostles were the best. To hear them, see performance videos, check out the band schedule, read biographical material and get some references click on the link below.